Forum Index > Historical Arms Talk > Why wasn't all mail half-solid? Posted: Tue 07 Aug, 2018 8:14 pm Post subject: Why wasn't all mail half-solid? Dan wrote in Mail: Unchained that the vast majority of mail from a very early time was made with alternating rows of riveted and solid rings. However, the end of the paragraph mentions this changing in Europe around the end of the middle ages, and I've seen enough pictures of all-riveted museum pieces to know they exist. I am now making my own blundering first experiments in mail making, just butting together galvanized 16 ga. rings of 3/8ths internal diameter that I'm making myself, and I'm basically using the method of pre-closing half of the rings, pre-opening the other half, and then weaving using the method described on artofchainmail.com. I fantasize about how much quicker it would be to punch half of my rings, and the only things stopping me are that I lack the equipment and know-how to punch rings myself, and that I'd decided for this first project not to buy any pre-made rings from others. What I can't imagine is why, once the half-solid method was discovered, any historical mail makers ever bothered to make mail that was entirely riveted. I read somewhere that making riveted mail takes something like four times as long as butted, so why would someone bother with more rivets than they needed to? Half-solid sounds so much faster to manufacture, but I would also assume it would be more protective by making half of the rings more resistant to being forced open. Is there some benefit to all-riveted that I didn't know about, or is there any downside to punched solid links? Posted: Tue 07 Aug, 2018 8:42 pm Post subject: Re: Why wasn't all mail half-solid? If your strictly speaking about European mail then it appears that after wedge rivets were widely accepted, solid links stopped being used. This goes along with the whole reason that wedge rivets were adopted instead of round rivets in the first place. While the reason for this has as far as I know not been proven, in my opinion the wedge shaped rivet seems to have solved an age old problem with riveted mail, which is the flexing of the round riveted link which caused rivet failure, solid links reduced the use of round rivets in half. Wedge shaped rivets do not flex to the same extent as round rivets, thus less rivet failure which eventually led to solid links being discontinued after a certain time period. Now inbetween the use of alternating rows of solid links and round riveted links and the introduction of all wedge riveted links there is evidence that alternating rows of solid links and wedge riveted links were used, with the solid link rows being slowly phased out. If solid links were as easy to produce during this time period as you assume they were then why indeed would the European mail smiths stop using solid links, someone here might be able to answer that question better than I can. Now with Indo-Persian mail, alternating rows of solid links and round riveted links were used right up to when riveted mail stopped being used which would include India, Persia, the Ottoman Empire and surrounding areas. You do occasionally find some Persian mail that is all round riveted though. 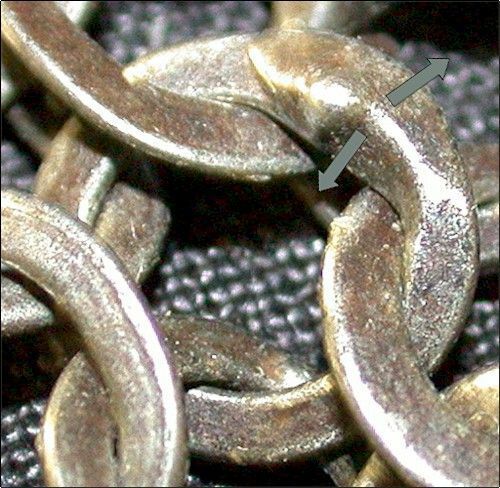 Wedge riveted links were not widely adopted by Indo-Persian mail smiths for some reason with the exception of Circassian makers of Ottoman mail even though they must have been aware of it. Posted: Wed 08 Aug, 2018 3:20 am Post subject: Re: Why wasn't all mail half-solid? Perhaps not all mail makers had access to punched rings. Posted: Wed 08 Aug, 2018 7:09 am Post subject: Re: Why wasn't all mail half-solid? Or wished to bother with them, makeing solid rings as thin as some of the wire used would be a real task. I'm sure that with good sheet metal and the right tool punched rings are fast and easy to make, but they didn't have a nice roper whitney hand punch. If there is quality sheet metal around then why not opt for some form of plate and mail? Cost and availability, in mails golden age we see small plates riveted together to make helmets, and that's about it. By the middle ages, each step in the process of making mail was a different job, controlled by a different guild. There were wire makers, and ring makers, and mail makers. Making sheet iron to punch out solid rings is generally said to be easier than drawing wire, since there is not as much concern about slag and metal quality. And you don't need *big* sheets of iron, of course. Punches are really not all that hard to make or use. Dunno! It's an interesting question. I can only assume the answer made sense to SOMEone, for some reason. Possibly for the same reason not everyone drives around in Rolls Royces ? Simple economics ? This is the most likely culprit. Probably a combination of using water power to draw wire somehow making the cost of raw materials so much cheaper that the increased labor no longer mattered. Punching rings from a sheet means much more wasted material than drawn wire. Even if you punch them in quincunx in your sheet, the inner circle is basically entirely wasted, and the outer leftover sheet is very thin, and quite likely to burn while you're trying to forge it back together. And also, drawing wire increases tensile strength (it's basically a form of work hardening). Flat sheet can also be work hardened, but it's surely more consistent with drawn wire (every single millimeter of wire length has been drawn for sure). And just because rings are made from round section wire doesn't mean they were not solid. Just a few days ago I visited Castelnaud castle, and they had one mail shirt there, where every single ring was forge welded shut. I didn't take any picture: the low lighting and greasy case from tourists forehead was a lack of time. Thanks to everybody who's commented so far. I'm learning so much that I didn't know, and there are so many different hypotheses. If your strictly speaking about European mail then it appears that after wedge rivets were widely accepted, solid links stopped being used. [...] Wedge shaped rivets do not flex to the same extent as round rivets, thus less rivet failure which eventually led to solid links being discontinued after a certain time period. Now inbetween the use of alternating rows of solid links and round riveted links and the introduction of all wedge riveted links there is evidence that alternating rows of solid links and wedge riveted links were used, with the solid link rows being slowly phased out. That's an intriguing connection. But even if wedge rivets had a lower rate of failure than round ones, wouldn't wedge riveted links have been just as tedious to make as the round riveted ones? I thought the whole point of solid rings was that they made the process faster, and in that regard wedge rivets don't sound like any improvement. If we know they were making half wedge-riveted and half-solid pieces at some point, I wonder why they felt the need to make all the links wedge rivited instead of just replacing the round riveted rings that made up half the garments. The thought had occured to me, but it seems counterintuitive that there would have been more mail makers without access to punched rings at the end of the middle ages than at the beginning. If the tooling and technique for punching rings was simple enough that they could do it in the simplified material culture of the Post-Roman world, and if armor making became ever more industrialized and concentrated in cities as the Renaissance got started, then why would the proportion of surviving mail that was half-solid decrease rather than increase? Thanks for opening up the wider context. This is a direction of inquiry that I'd expect a more satisfying answer from. Probably a combination of using water power to draw wire somehow making the cost of raw materials so much cheaper that the increased labor no longer mattered. That really would explain it for me if it were the underlying cause. I'd love to read about exactly what mechanism they used to draw wire using water power. I wonder, though, whether they used or could have used the same water power to make beating steel into plates and punching out rings that much quicker. Might it have to do with the fact that other artisans besides mail makers had reason to buy mass-produced wire? Just how many uses did wire have back then? I suppose decorative inlay comes to mind. I can imagine that wastage would have been a big problem. Was iron expensive enough back then that wasted material would have outweighed the labor savings on the mail maker's end? I hadn't thought about the work-hardening aspect either. If that's the case, then would forge welded rings have been the strongest because they were both drawn from wire and effectively made solid? I'd imagine they were the most expensive kind, but would saving material have made them more economical than punched solid rings? Would it make sense to make a shirt out of half wedge-riveted rings, and half welded? I personally believe that the whole point of using solid links was to make mail armor stronger, less riveted links, less link failure. I think you are confusing our thoughts in our times on what is and is not easier / tedious etc with what people who actually made mail armors thought about making riveted links verses solid links. Take Indian riveted mail for example, their solid links were forge welded, and theta solid links have an extra bar forged inside the solid link, this was not easy at all but they did this for strength and protective purposes, remember labor was cheap and mail makers from all cultures were probably just glad they had a job and maybe making mail was preferable to working in the fields or in a mine etc. I still think that in European mail armor, the solid links had to do with strength and not ease of manufacture, at some point most European mail makers abandoned solid links, if they were considered easy to make would they have done this? With plate armor becoming the primary armor, maybe mail armor just did not need to be as heavy duty as it used to be and the solid links were thought to be overkill. Now in Persia, India, and the Ottoman empire solid links continued to be used until mail armor ceased to be worn in combat. Since they did not have primary plate armor for the most part they kept the solid links, this is how I see it. Whole mail was welded? No riveted rings? Are you sure it's an original mail shirt? 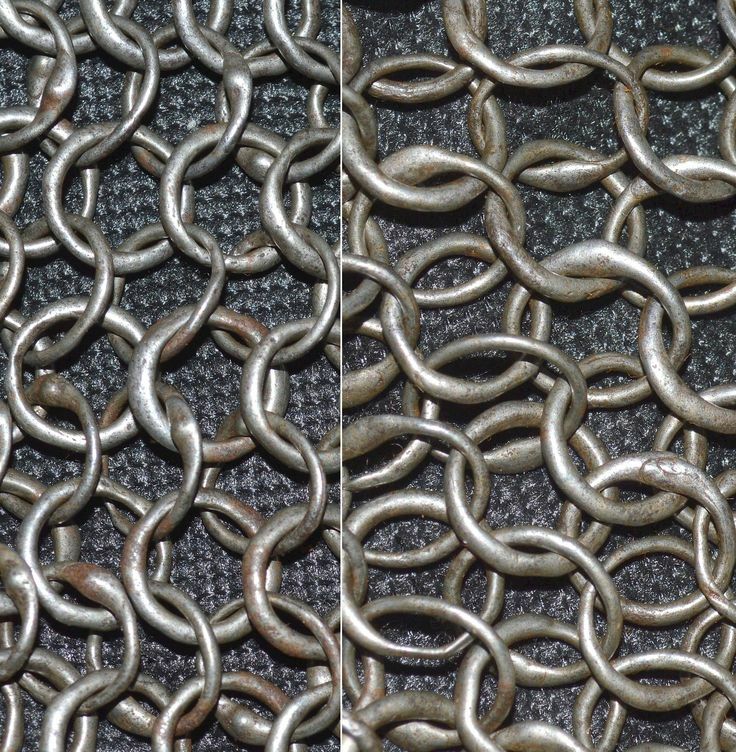 Here is an example of European mail that I estimate is from around the 1300s, it has alternating rows of solid links and wedge riveted links. This would make it from the period right before mail makers stopped using solid links. The solid links appear to have been forged welded shut since they are round stock and not punched. Forge welding solid links would not have been easy, if these were the type of solid links that mail makers eventually stopped making altogether I could understand why. Is there any evidence that mail makers were still punching solid links during the time period when solid links stopped being used and all wedge riveted mail started to be made? Actually its not hard to make a welded ring. You take a ring with overlap, just like you would for a riveted ring, heat it, flux it, reheat to welding temp., and then use the tongs (as opposed to hammering on the anvil) to fuse the overlap together. I've done it, and it works pretty well. And even if the weld fails, you simply flatten the overlap, punch and now you have a riveted ring. Posted: Thu 09 Aug, 2018 7:48 pm Post subject: Re: Why wasn't all mail half-solid? This goes along with the whole reason that wedge rivets were adopted instead of round rivets in the first place. While the reason for this has as far as I know not been proven, in my opinion the wedge shaped rivet seems to have solved an age old problem with riveted mail, which is the flexing of the round riveted link which caused rivet failure, solid links reduced the use of round rivets in half. Wedge shaped rivets do not flex to the same extent as round rivets, thus less rivet failure which eventually led to solid links being discontinued after a certain time period. There is another aspect as well. With the wedge rivet one drifts a slit, rather than punches a hole in the ring. Thus, no material is lost which would of course weaken the ring. Even better, in addition to eliminating flexing, the now retained material is formed into a thickened watershed when riveted, making for an even stronger join. My personal experience is that assembling all riveted mail is around 40% more labor intensive than assembling demi-riveted mail. The current train of thought is that the transition to all riveted mail in Europe began somewhere before 1300 and continued until circa 1350, when all riveted construction became more normal. These suppositions are very broad, and are certainly inaccurate in the details, but such is the problem with lack of specific datable examples. The contradictory information regarding pricing provided by Randall Storey in his thesis, Technology and Military Policy in Medieval England, c.1250-1350 indicates that the cost of mail was sharply declining during this same timeframe. overall trend is corroborated by prices of other substantial arms. So how do you increase the time of fabrication while greatly reducing the price? The cost of raw materials like iron seem fairly constant when adjusted for inflation, so the area impacted must fall in the manufacture of value added products like drawn wire or hammered sheet vs. punched or rolled rings, or in the cost savings of volume production. I am amazed by the parallels in modern lithium-ion battery production, where materials costs are somewhat stable, or slightly higher due to higher demand, yet the costs of the finished cell is drastically falling. Posted: Thu 09 Aug, 2018 11:04 pm Post subject: Re: Why wasn't all mail half-solid? Arne, I agree that the watershed helped eliminate movement in the link, instead of two flat surfaces meeting you had two slight valleys, I do not think watershed was accidental. My personal experience is that assembling all riveted mail is around 40% more labor intensive than assembling demi-riveted mail. Mart, are you talking about forge welded solid links or punched solid links? Posted: Fri 10 Aug, 2018 1:35 am Post subject: Re: Why wasn't all mail half-solid? Round riveted links weren't punched. They were done with a drift just like wedge rivets. No material is lost with either method. Modern riveted mail is often done with a punch, which is yet another reason why they are weaker than extant examples. Neither. This is additional labour just for weaving the mail. The labour cost of actually making the links is a different calculation. Steve Sheldon proposed this method too. It is the only method that seems feasible to me. If you try it on an anvil, the heat gets sucked out too quickly.